As these findings show, you can't afford to take a reactive stance in the fight against white collar crime. It's critical to fortify your defenses and teach employees about the latest fraud prevention and detection techniques. Chances are good that your company already has policies and procedures in place to prevent and detect fraud. 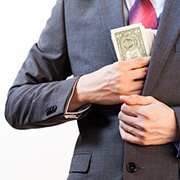 Together, these antifraud efforts are known as your internal control system. International Fraud Awareness Week is a good time to pause and reflect on your internal controls. Ask your management team: Are our existing internal controls adequate based on today's global, technology-driven marketplace? And how could we make them stronger? 2. Risk assessment. Companies should continually evaluate external threats and internal weaknesses. Once they've been identified, threats and weaknesses need to be eliminated — or at least reduced and monitored. 4. Control activities. Strong systems include formal policies and procedures to ensure management's directives are carried out. Examples of control activities include authorization of transactions, accounting reconciliations, supervisory reviews of operating performance, physical security of assets and segregation of duties. COSO recommends that companies design their antifraud controls "to provide reasonable assurance [of] the achievement of objectives in the effectiveness and efficiency of operations, reliability of financial reporting, and compliance with laws and regulations." A strong internal controls program — including fraud prevention and detection training, proactive data monitoring and analysis, employee support groups, management review, and whistleblower hotlines — can be essential in preventing and detecting fraud. Outside fraud examiners are often more efficient than insiders when it comes to investigating fraud, because they're disinterested third parties with no emotional attachments or preconceived notions about the accused. In addition, they're experienced in common fraud scams and know where to look for evidence. Forensic accountants and attorneys also know how to build a comprehensive case using analytical and interrogation techniques that will withstand legal scrutiny. After International Fraud Awareness Week is over, it's important for businesses to remain focused on fraud awareness, because these crimes happen year-round. Perpetrators generally need three elements in place to act: opportunity, motive and rationalization. Regular staff training and strong internal controls eliminate the opportunity to commit fraud and deter would-be fraudsters by letting them know that you won't tolerate fraud and have implemented controls to detect it.